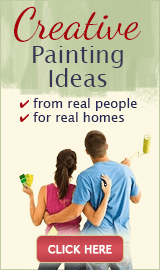 I chose this muted/earthy shade of pink for my paint color, because I was looking for something different and unusual. I didn't want my room to look like everybody else's living spaces. Also, I thought this color would contrast nicely with my area rug, pecan furniture that I had restored, and my green curtains. At first, I wasn’t sure if the bright green shade of the curtains would work with the wall color, but then I read somewhere that green goes with almost anything, and now I think it really does. 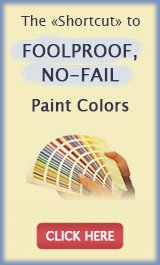 The name of the paint color is "Clove Scent" from Valspar - I had used Valspar brand paints in the past, and always with success. The paint went on the walls with ease, and covered the walls in one coat. 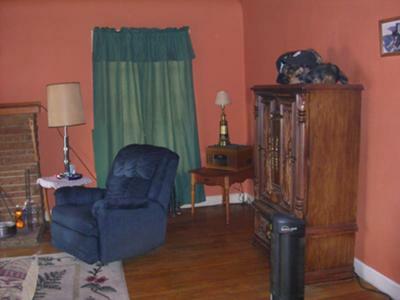 I painted this room in June of 2006 and it still looks fresh. When I started painting the walls, the color looked too bright, but after the paint dried, it darkened. I love how the wall color coordinates with the rest of my living room, and makes the objects really stand out. Many people who have walked into my living room, have complimented on my selection of color and said it looks and feels warm and inviting.